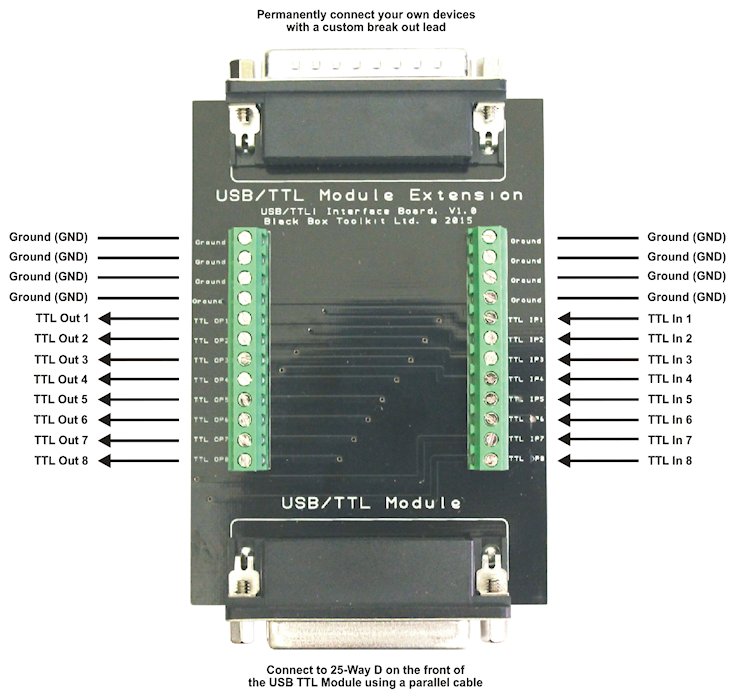 It doesn't matter which experiment generator you use to run your computer-based psychology experiments the Black Box ToolKit USB TTL Module helps with basic TTL event marking/TTL triggering when you don't have access to a parallel port. Designed as a parallel port replacement for simple event marking. 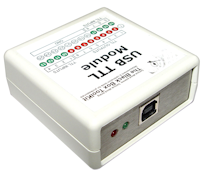 Plug into a USB port on your PC and our USB TTL Module will appear as a Virtual Com Port (VCP). To event mark send two hex bytes from your experiment generator. Quickly and easily TTL event mark/TTL trigger with any experiment generator via standard one line serial commands, e.g. task events in E-Prime. Works out of the box with E-Prime, SuperLab, Presentation, Inquisit, PsychoPy or any other software that can read and write to a standard serial port. When triggering from MRI, EEG, ERP, MEG systems wait for a sync pulse that has been converted to two incoming hex bytes. Think of the module as a USB to TTL adapter or TTL to USB interface. 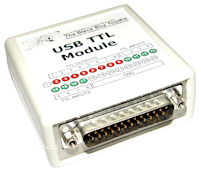 All USB TTL modules ship with a USB host lead. An optional breakout board enables you to wire your own cables before making them permanent. *Remember although our USB TTL Modules hardware is millisecond accurate and helps you produce simple event marks in your experiments it cannot automatically correct for any mistimings that are inherent within the experiment generator or other hardware you use. For self-validation you should independently check the accuracy and consistency of your experiment generators presentation and response event marking with a Black Box ToolKit v2 together with a BBTK USB TTL module. To independently TTL event mark stimuli and responses with sub-millisecond accuracy you should use our mBBTK v2. The unique mBBTK v2 takes over all timing and event marking duties from any experiment generator so you can be 100% sure of your presentation, synchronization, response timings and event marks. Compatible with all Psychology experiment generators, e.g. E-Prime, SuperLab, Presentation, Inquisit, DMDX, ERTS, DirectRT, PsyScope, PsychoPy, OpenSesame etc. 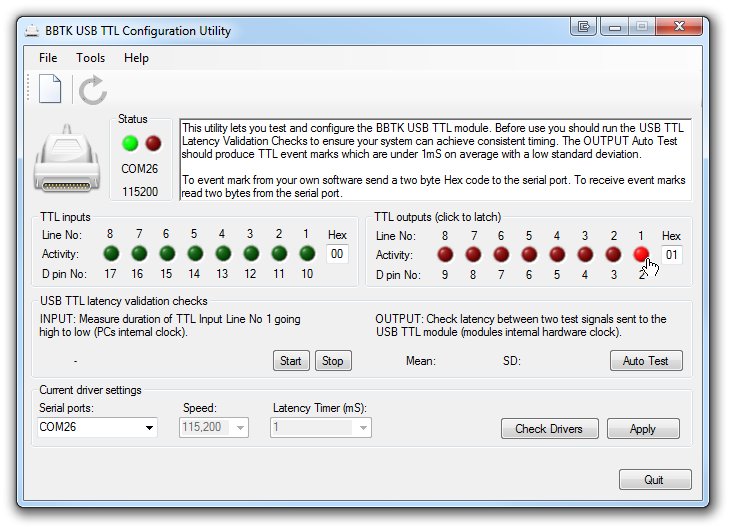 Using the BBTK USB TLL event marking module is easy. Simply open a standard serial port and send two hex bytes to event mark. In the examples shown below for PsychoPy, E-Prime and MATLAB the module event marks on TTL Out Line 1 (01) immediately prior to a stimulus image being displayed. Once the stimulus terminates all TTL lines are cleared with 00. A breakout board lets you quickly and easily connect individual TTL lines before making a permanent connection. Pins 2~9 correspond to TTL Output Lines 1~8 and pins 10~17 to TTL Input Lines 1~8. Pins 18~25 are grounds. Output pins shown in RED, input pins in GREEN. Configuration software lets you check that the module is operating correctly and assess round trip timing on your PC. #Dependent on specific USB subsystem and using the USB TTL configuration utility to check for correct installation and validate latency before use. *Remember although our USB TTL event marking modules are millisecond accurate they can't automatically correct for any mistimings that are inherent within the experiment generator you use.